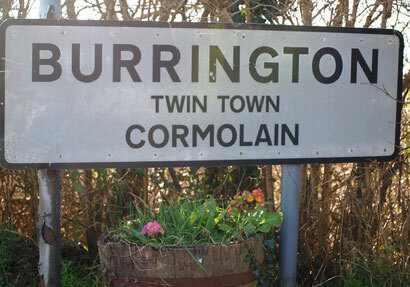 Burrington is twinned with Cormolain (perhaps you drive past the sign every day?). It was started by the two Parish Councils in 1976. Cormolain is a village in Normandy (halfway between Caen and St Lo and south of Bayeux. It is just 185 miles away (as the crow flies). Both are agricultural parishes of similar size and population. The purpose is to exchange visits, staying with families in the Parish so as to get to know something of each other’s way of life. We stay in their homes and join in their every day activities, Sometimes it’s slow going as their English and our French is none too good! – but that’s half the fun of it. All ages are accommodated – from 3 years old to 80, singles, couples, families, children, teenagers, young of age and young of heart. Normally excursion(s) are arranged to places of local interest. We have been to the SS Great Britain, Mid Devon show, Falmouth, Exmoor, Dartmoor, Exeter, local steam railways and, of course, the North Devon beaches for example. They have taken us to vineyards, the D Day beaches, the Bayeux Tapestry, a Calvodos maker (not that many of them don’t make their own and sampling of this and wine is done with gusto), equestrian centres – in fact many of the local bits of France that a tourist doesn’t get to see. The exchange of hospitality and culture is the main thing and this, of course, means lots of eating, drinking and talking (dictionaries to the fore). Visits are 5 days long (including travel). We go to Cormolain one year and stay with French families. The following year they visit Burrington and stay with us in return. Costs are kept as low as possible (travel at group rates), no hotel bills and much entertaining is done “en famille”. For the rest of the year we meet socially with BBQ’s, bring and share evenings, Christmas dinner etc, maybe 4 or 5 times a year where we exchange ideas and experiences and plan for the next arrival of “Les French” or of our visit to them. It’s all very informal and we welcome new members. Why not come join us at our next get together in Burrington?